The period covered by Arts:Search is 1919-1921. Available now. 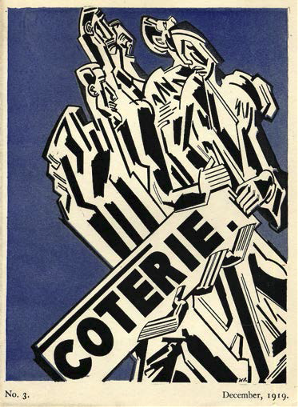 Coterie was one of a number of short-lived literary and artistic magazines published during or immediately after World War One. Few of them survived for more than a few issues and Coterie was no exception, running for only 7 issues, including a double number (May 1919-Winter 1920/21). It was edited by Charman Lall (nos 1-5) and by Russell Green (nos.6/7). During its brief history, Coterie succeeded in attracting contributions from writers who were in the vanguard of the Modernist movement in Britain including T.S. Eliot, Aldus Huxley, Edith, Osbert and Sacheverell Sitwell, Herbert Read and Edmund Blunden. Artists illustrated in Coterie included Adrian Paul Allinson (who designed the cover of no.2), Walter Sickert, William Rothenstein, William Roberts (who designed the cover of no.3), Modigliani, Edward Wadsworth, John Flanagan, John Turnbull, David Bomberg (who designed the cover of no.4), Ossip Zadkine. André Derain, Mary Stella Edwards (who designed the cover of no.5), Alexander Archipenko, René Durey, and Nina Hamnett (who designed the cover of nos.6/7 and was on the Editorial Committee of Coterie).